I love eggs! They start my mornings off with high protein satisfaction. When you eat protein, you feel satisfied for longer and you are less likely to experience sugar highs and lows, crashes, and cravings. It doesn’t have to be eggs, though. Find some healthy sources of protein you enjoy and make them a part of your everyday meals. Plan ahead to not have the cupcake in your house in the first place. Or plan ahead to have satisfying snacks with you when you are out so that you don;t wind up STARVING and ready to eat anything in the world. Shop wisely and stock your fridge and pantry with good choices. Change how you think about food as a reward. Think about other things you enjoy that you could use to replace a “cupcake” as a reward for a surviving a stressful day or doing something difficult. Maybe you would like to get your nails done or take a long bubble bath. Make a conscious decision to change what you think about as a “treat” and you will find it easier to NOT eat the cupcake. Hit the pause button in your brain. When you feel a craving, just PAUSE. You don;t have to say no, you just need to wait and re-visit the idea a little while later. Often, you will find yourself distracted after a few minutes and will forget about the cupcake you never really needed in the first place. 5. Just Eat the Cupcake. It’s just a cupcake. Don’t give it the power to make or break your day and self esteem. Everything in moderation and balance! Sometimes it’s ok and appropriate to say yes to a cupcake, as long as your life and eating habits are otherwise in balance. It’s not about one cupcake. This week I share an inspiring conversation I had with recording artist Andrea Thomas. Andrea shares what it’s like to work in the world of Catholic music and ministry, and some of the joys and trials she has experienced along the way. At the end of the show, I share Andrea’s latest song, He Rose Again. Thank you to Lisa who is the newest supporter of Girlfriends through Patreon. If you would like to leave a review and subscribe on iTunes, I would be so grateful! As always, I am so grateful for your presence here. God bless your week! 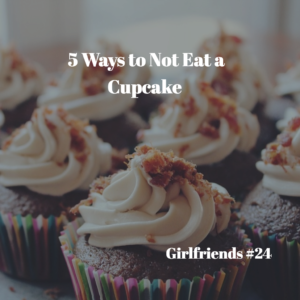 One way I don’t eat the cupcake – Since I work in an office full time I try super hard to not eat what I can buy at the grocery store when people bring in cookies and cupcakes. This helps a lot around the holiday’s. If someone brings in homemade sugar cookies I take one. If it is store bought and I can get it all year long and it just happens to have white frosting with red and green sprinkles for the season, I pass. I have a sweet tooth. I found I was eating that junk at the office just because it was sugar. I found that I don’t really like the bulk made cupcakes and cookies anyway. It allows me to enjoy the sweets I really like when I get home at night. Thanks for all you do with the podcast! Very smart, Melissa! Half the battle is knowing your weaknesses & then setting reasonable limits. Great job! ?